In my previous post I mentioned a tour we took of Letterpress Distilling and the great limoncello that they make by hand. They challenged us to create a recipe using their limoncello. Their favorites will be served at their 3rd anniversary party. I thought I'd do a play on lemon thyme and use Limoncello for both the marinade and the sauce for the plated chicken. I thought it turned out very well. If you can't find a good limoncello you can substitute vodka and lemon juice. I used chicken breasts for this recipe but you may use thighs which are more forgiving if overcooked. 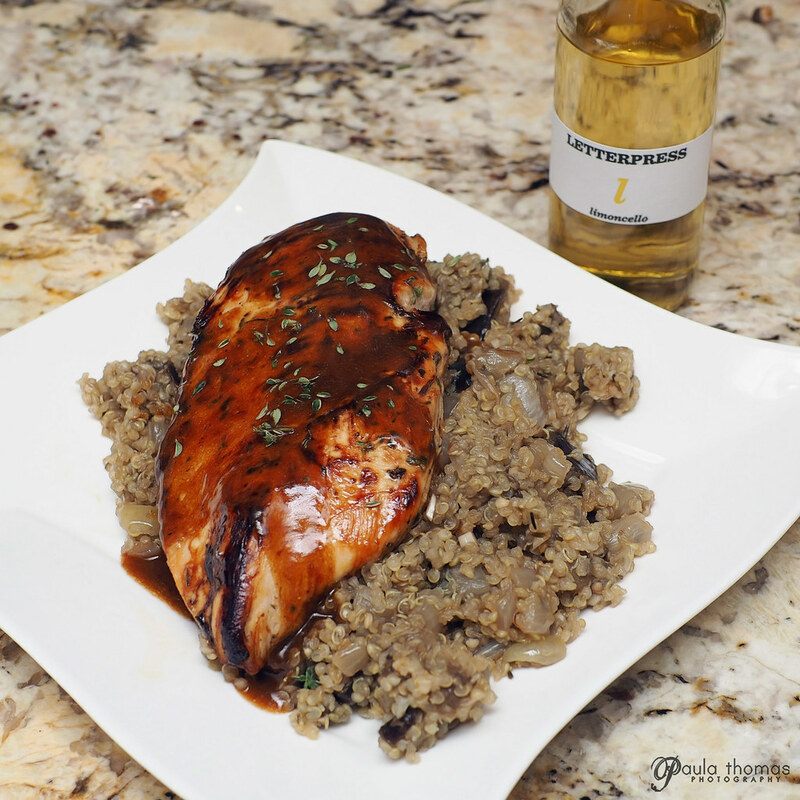 I served it over a bed of eggplant and onions stir fry mixed with quinoa. Add marinade ingredients to a small bowl and whisk until well combined. Add cooking oil to a skillet and set to medium high heat. When pan is hot, add chicken, and set aside the marinade. 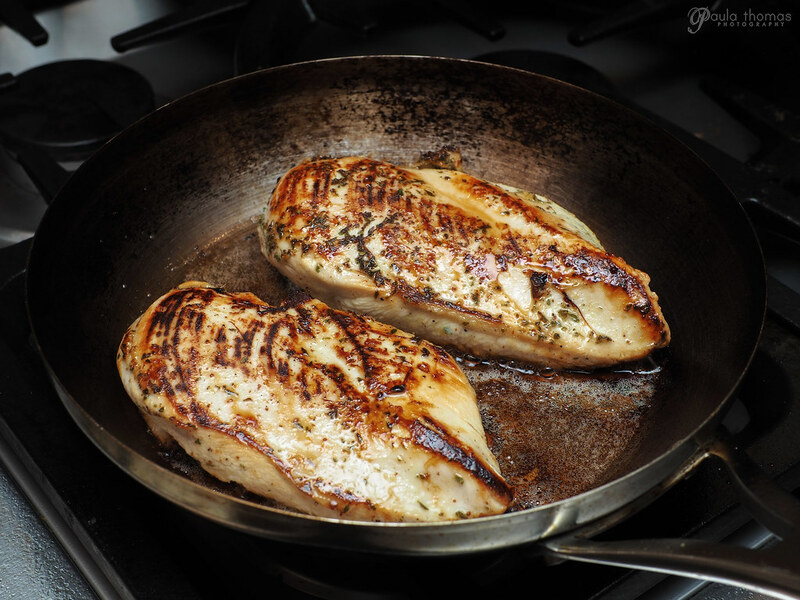 Cook chicken on each side for approximately 5 minutes or until well browned. Place chicken on a cookie sheet lined with aluminum foil and into preheated oven. Check temperature of chicken every 5 minutes until chicken reaches 165 degrees, approximately 10-15 minutes. While chicken is in the oven, add corn starch to chicken stock in a small bowl and stir until combined. Deglaze the skillet with the left over marinade and simmer at medium heat for a couple of minutes. Add lemon juice and chicken stock/corn starch mixture and stir frequently until chicken is done. When chicken is done, remove from oven and cover with aluminum foil to keep warm until ready to serve. Add butter to sauce and stir until melted. Add salt and pepper to taste. If using thighs you can add chicken to the sauce pan and serve when ready or plate the chicken with sauce over the top. Garnish with fresh thyme leaves.